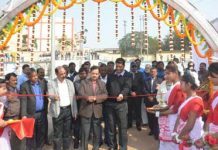 Ranchi: Sampark Foundation in collaboration with Jharkhand Education Project Council, Government of Jharkhand flagged off Sampark Smart Shala Program across all government primary schools in Jharkhand today with the signing of MoU. 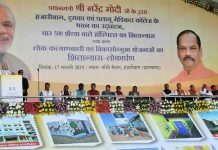 Hon’ble Chief Minister of Jharkhand Shri Raghubar Das and Shri Vineet NayarFounder Chairman, Sampark Foundation and Former CEO, HCL Technologies Ltd. announced the state-wide launch of the Sampark Smart Shala Program. 1. Audio Sound Box to assist the teachers in teaching English and Maths. 2. Audio lessons with music, songs, stories and games. 3. 3D teaching learning aids to make learning fun. 4. Tracking and monitoring learning outcomes through a mobile app. Under this MOU , Sampark Foundation is focused on 4 goals 1) Train over 60,000 teachers on the Sampark Smart Shala 2) Distribute over 26,000 Sampark Smart Shala Math and 26,000 Sampark Smart Shala English kits 3) Monitor progress of 40 lakh children on a monthly basis through “Sampark Smart Shala App” 4) Create an Education Quality resource group for Math and English at the Block, District and State level to focus on improving learning outcomes of children in primary government schools through Sampark Foundation Master Trainers located in each district alongside the State Government leadership team.